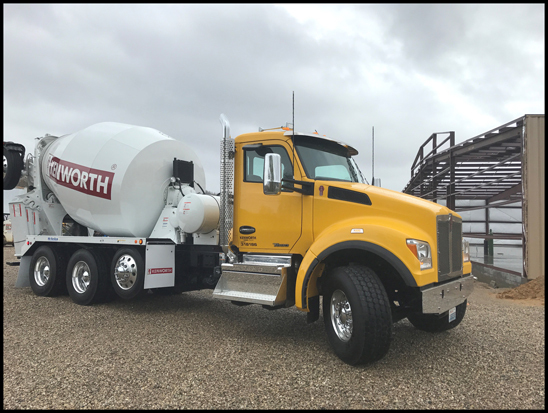 KIRKLAND, Wash., Sept. 29, 2017 –- Kenworth Truck Co. will display two new T880S set-forward front axle mixers in its booth (No. 828) at ConcreteWorks 2017 presented by the National Ready Mix Concrete Association (NRMCA). The show runs from Oct. 1-3 at the Gaylord Texas Resort and Convention Center near Dallas in Grapevine, Texas. One Kenworth T880S on display features a 5-axle federal bridge-formula configuration with a Con-Tech mixer body. The truck is destined for GCC of America after the show. The other T880S is a 4-axle standard mixer with McNeilus body destined for Pennsy Supply, an Oldcastle Company. Kenworth is offering a $2,000 savings to NRMCA members on qualifying purchases of new Kenworth T880, W900, T440 or T470 vocational trucks through the association’s M2M Benefits Program. The program runs till the end of 2017. The weight rating for the set-forward front axle on the T880S ranges from 14,600 pounds to 22,800 pounds. Contractors can also choose single, tandem or tridem drive axles, and a wide variety of factory-installed lift axles, to meet their jobsite requirements. The T880S provides clear back-of-cab options that make it easier for body upfitting. The T880S is standard with the 12.9-liter PACCAR MX-13 engine, which provides up to 510-hp and 1,850 lb-ft of torque. For weight-sensitive applications, the 10.8-liter PACCAR MX-11 engine saves 400 pounds compared to a 13-liter engine, offers an impressive power to weight ratio, and low fuel consumption. The PACCAR MX-11 with up to 430-hp and 1,650 lb-ft of torque is well-suited for ready-mix trucks.